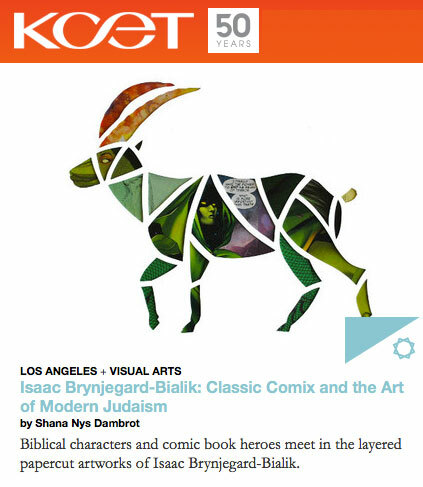 Isaac Brynjegard-Bialik: Nice Jewish Artist: KCET Artbound profile: "Classic Comix and the Art of Modern Judaism"
KCET Artbound profile: "Classic Comix and the Art of Modern Judaism"
I'm pleased to post a link to a new review of my work by Shana Nys Dambrot on KCET Artbound. Ms. Dambrot visited my current show, "Women of Valor and Other Super Heroes," at National Council of Jewish Women / Los Angeles and spoke to me about my work, my influences, and my inspiration. "Bridging youth and popular culture with a thoughtful conversation on the lessons of the sacred Jewish texts may seem like a daunting task. In fact, it is a job for Superman." "Brynjegard-Bialik brings these different types of stories together in the complex but clean layers of his papercuts, creating new meanings for the world's oldest stories as he engineers these combinations with the architectural presence of stained glass, the whimsy of gilded-age fairy tales, and the meditative aura of illuminated manuscripts." The show is only open for a few more days – contact Carrie Jacoves at 323-852-8512 or carrie@ncjwla.org to find out when you can see it.